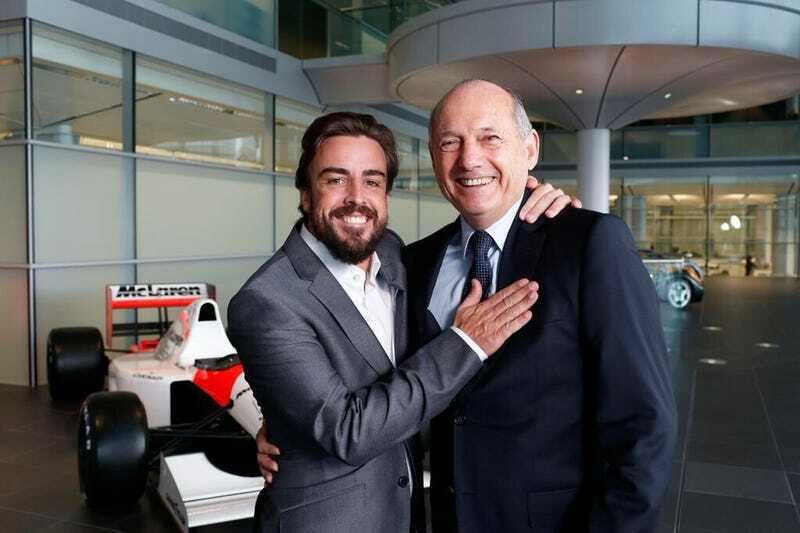 Fernando Alonso will rejoin McLaren and try to unite with Ron Dennis in the Woking team's Honda-powered 2015 F1 car. Jenson Button will drive alongside the Spaniard, in what I hope will be Alonso's toughest challenge since dueling Lewis Hamilton in 2007. Unfortunately for Kevin Magnussen, he will be dropped back to official reserve driver. I am joining this project with enormous enthusiasm and determination, knowing that it may require some time to achieve the results we are aiming for, which is no problem for me. Over the past year I have received several offers, some of them really tempting, given the current performance of some of the teams that showed interest. But, more than a year ago, McLaren-Honda contacted me and asked me to take part, in a very active way, in the return of their partnership – a partnership that dominated the Formula 1 scene for so long. McLaren-Honda's repeated and open desire, perseverance and determination in making it possible for me to join their exciting renewed partnership, have been some of the main factors that made me take this decision, not forgetting the most important factor of all: we share a common objective and expectations, and there is a very solid future, with confidence, ahead. I have had in-depth discussions with all the senior people at both McLaren and Honda, I have viewed their fantastic facilities in both the UK and Japan, and it is clear to me that, together, McLaren and Honda are in the process of beginning what is sure to be a long and successful partnership. And I intend to give 100% effort to help make it exactly that. Finally, I want to thank the persistence of those who have fought so hard for this to come true. I will do everything in my power to deliver for everyone and for our team, based on a formula that has always worked for me: effort, sacrifice, perseverance and faith. We have time, we have hopes and we have the necessary resources. Let the legend return: that is our challenge. I am extremely excited to be embarking on my 16th year in Formula 1 and my sixth season for McLaren. Like Fernando, I am certain that McLaren and Honda will achieve great things together, and I feel sure that, working together, all of us will pull incredibly hard to create a brilliantly effective winning team. I admired Ayrton Senna enormously, but, for me, it was the exploits of his McLaren-Honda team-mate Alain Prost that inspired me most as a boy. The way he stroked those beautifully brutal red-and-white cars to grand prix wins and world championships was to my mind poetry in motion, and I have tried to emulate his driving style ever since. Being a part of new-look McLaren-Honda is a wonderful opportunity for all of us, and I am very pleased to have been invited to do my bit. In fact, I am absolutely raring to go. I am also very glad that Kevin will remain part of the team. He is a very quick driver and a really nice guy. Looking forward, I know the Honda guys well, having driven Formula 1 cars powered by their engines from 2003 to 2008. I have a huge amount of respect and admiration for them, and promise to give 100% to make their partnership with McLaren a success. Last but far from least, I am very much looking forward to having a driver as fast and as experienced as Fernando as my team-mate. I am sure we will work extremely well together." I am absolutely delighted to be on the threshold of leading McLaren-Honda to a new era of partnership, and I speak on behalf of all at McLaren when I say that. I am equally confident that our colleagues at Honda share that determination and passion to win. As regards drivers, McLaren's policy has always been to assemble the strongest line-up possible, and in Fernando and Jenson I firmly believe that is exactly what we have. We signed Fernando a little while ago, but we decided not to announce the fact until we had also re-signed Jenson as his team-mate. For many reasons our negotiations with Jenson took quite a long time, but, now that they have been concluded, we are confident that our collaboration with him will continue to thrive in the future every bit as well as it has in the past. Make no mistake about it, Jenson is 100% committed to McLaren-Honda, to Formula 1, and to winning. As a pair, he and Fernando are supremely experienced. Fernando has started 234 grands prix, has converted 32 of those starts to victories, has stood on a grand prix podium 97 times, and has won the drivers' world championship not once but twice. He is a class act. He is 33 – which, for an athlete as physically fit as he is, constitutes a Formula 1 driver's professional prime of life. Moreover, he is old enough to be experienced and expert, yet young enough to be enthusiastic and energetic. I therefore firmly believe he will deploy those four e's – experience, expertise, enthusiasm and energy – to drive forward McLaren-Honda's on-track success next season and for quite a few seasons to come. As for Jenson, at 34, he is every bit as fit as Fernando but even more experienced: he has started 266 grands prix, has won 15 of them, and has stood on a grand prix podium 50 times. He, too, is an ex-world champion, and is one of the smoothest and fastest guys out there. To sum up, Fernando and Jenson have started a combined total of precisely 500 grands prix between them – a mighty aggregate – and have won 47 of them. I can safely say, therefore, that we now have by an order of magnitude the best driver line-up of any current Formula 1 team. Finally, I want to thank and pay tribute to Kevin, who has done a great job this season and will continue to be an integral part of our team. He will be our test, reserve and third driver, and remains an excellent prospect for the future." How do you see this pairing working out? I expect more of a battle between Jenson Button and Fernando Alonso than others have mentioned.